Bought after selling Cb125f, My heart was really going towards ybz but unfortunately after getting big losses in quick time in two brand new bikes cd70 dream & cb125f. I could not dare to take risk so decided to go for safe choice. Its the first time ever I have bought classic shape cg125. I have been hater of cg125 criticize it alot but fate I had to buy it none option looked best after being disappointed with cb125f. I bought it because of the new changes self starter, 5 gears, improved rear brakes & new improved chassis. I have wished to go for Yamaha but the reason I have mentioned as earlier many times no proper dealership, no after sales support at all & no resale at all in my city. These things always make me think too much when going for Yamaha & in the end I have never made up mind to go for Yamaha. I had multiple times opportunity to go for ybr or ybz but could not convince myself. Ahl have done major changes & compelled to do so looking at the raising demand for features like self start, alloys etc. They launched cb125f to compete with ybr no doubt shape wise & features wise very good bike but price tag of the very high specially when we look at the same decades old ohv engine. So 162k price is no way justified for that bike. Same way CG125S launched by Ahl and this is also direct competing product launched by Ahl to compete with ybz. So now in 125cc category Ahl has introduced 3 versions. 1st CG125 4 Gear 2nd CG125S with two editions 3rd CB125F with two edition as well. This is good range but don't know why Ahl products have become so expensive specially when see these two cb125f & cg125s. Ahl discontinued Deluxe 125 at 130k & now we have cg125s for 135k. Which has self starter but lacks disc brake I believe atleast they should have added disc at front. And personally I would have loved to see CG Dream shape instead of keeping same classic shape. But I think that option did not look practical to them for getting high no of sales. As we know that Cg Dream was discontinued because of poor sales. So keeping exact same shape looked best choice to them & this saved them investing. Although i think they should have done atleast some minor changes like a bit different headlight & tail light some thing different for same cg125 i mean you are demanding 135k for this bike. So far the experience is good obviously acceleration & power feel is really good. 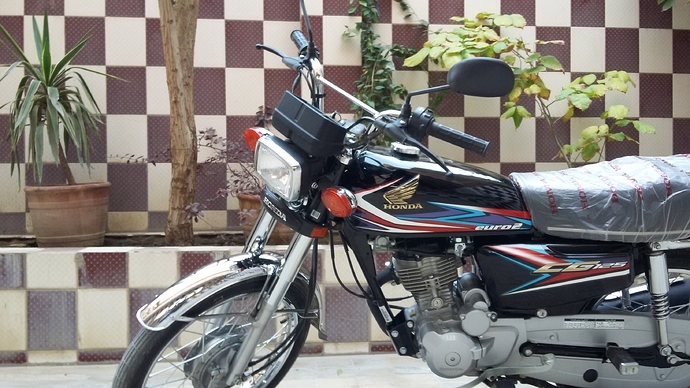 Self starter, 5 gears are really good to have specially self is really fun & feels awkward in cg125. People get really surprised when I self start it. Today i received really funny comment from one cg125 owner standing near me. He came me to asked is this self start I said yes he said it is chinese I said no its Honda He was kinda shocked but looked really impressed to see the self starter & when i told him it has 5 gears there was grin on his face. This tells that it is going to good response from people. And Ahl have played this card to keep the Pakistani people stick to same old tech Ohv. I wish Had they introduced new Honda Ohc engine of same power if not in cg125s atleast in cb125f which they are selling for 162k. Riding experience with Ohc engine with balancer is so fun & smooth. Ahl has tried to remove vibration as much as possible & they have improved chassis. But ohv engine would produce vibration at high rpm's no doubt in that It can never be as smooth as Ohc engine in Cb150f or Ybr. Vibrations at low speed have been removed fairly & experience is no doubt smoother. I have noticed very less vibrations till 60km/h I have taken it to 70km/h but have not judged it properly. Lets wait for the break in period to complete and I take ride on highway. I will properly try to check how much vibrations does it produce. So far uptill 60km/h in city there is no doubt vibration have been reduced & experience is good. You feel slight vibration in handle & footrest very slight. To be honest they are not to troubling level I mean you can enjoy riding it. Rear Brake Ahh atlast finally Ahl heard & cared little bit for crazy cg fans. Rear is updated with bigger size hub & there is good improvement in rear brake. This to me looks hub of Deluxe 125, New stronger chain cover is installed no more chain cover kir kir noise. Left side deluxe switch assembly & clutch cable is installed & headlight is not dependent on generator anymore. It can be switched on with ignition on no need to start bike. New Rear Brake finally is good to see But I believe they should have added an disc at front as well. When we look at price 135k & this is powerful 125cc Disc brake is requirement for this bike. I hope Ahl would consider installing disc brake if they truely care for their loyal customers. Bike is nearly touching 1k odometer is on 910km. Had the chance to ride it on highway as two quick oils I have already changed of bike so decided to check how it ride on high speeds. Actually riding experience at higher speeds as I was expecting gonna be same very poor like old cg125. I have never bought cg125 this is my first cg125 but I have ridden my friends cg's in past. And I from very begenning hate this bike. However I have bought Deluxe & two times Cg125 Dream. Stability point of Deluxe was better but same ohv engine it had vibrations as well but comparatively lesser from cg125 and riding position comfort obviously better. Even CG Dream if I compare its ride stability at higher speeds like 100km/h to cg125's was definitely better but surprisingly better than current cg125s 2019 as well. And in comfort definitely better & style obviously alot better than cg125 or cg125s. CG125S has lesser vibrations upto 60km/h but 70km/h you feel more vibrations in handle & at 80km/h little more. Compare to previous they are reduced little bit specially at feet footrests. But above that simply you can't ride it for longer time & speeds above like 90-100km/h Its seriously dangerous machine to ride I mean you are seriously risking your life. It shakes has no stability same like previous cg's. Its really strange even cg dream was alot more stable to these speeds which had 4 gears. 5th gear in cg125s is beyond my understanding even in cb125f as well. They don't really decrease rpm's. I had cg dream i compared its rpm's with 5 gear cg125s they are same at same speeds. for example cg dream did 70km/h at 6500rpm same way 5 gear is doing same speed at same rpm's. So whats benefit of 5th gear??. CB125F has definitely more smoother experience but that bike really does't justify its price at all with same ohv engine. So does this CG125S as well but compare to improvements done to counter reduce vibrations results of AHl work are good one in case of CB125F. Its riding experience was not pleasant also at 100km/h but no shaking or unstable like cg125s & vibrations are felt lesser as well. I mean you are in some control of your bike but that bike also because of ohv engine you can't ride it for longer time at these speeds max 90km/h you could ride it for longer time. I have riding experience of ybr-g back in 2016 but i have never ridden cb150f. Ohc engine of Yamaha was very smooth & CB150F owners really adore the smoothness of it as well. So simply if we compare Ohv engine fitted in cb125f or cg125s with some improvements done to chassis. Still despite all efforts there is no comparison of this engine with smoothness level of latest Ohc with balancer shaft Yamaha's Ohc engine & Honda's cb150f's Ohc engine specially high rpm's. complete and honest review from your end as to how the bike performs once you push it to the limits (I am quite sure that you will!)! TAAPA on both the motorcycles sides…. did they remove it later on ? fall apart. You believe that this issue has been RESOLVED in this one ? 3) My final question, I once only SAT on a 125 & its seat…was as hard as a wall… in my opinion (I’ve been using Suzuki GD 110 for last 6 years which has amazingly comfortable seat (sharing this so you can do the comparison). Have they made the seat more comfortable for longer drives or not? Have fun driving, stay safe & always wear helmet! Actually in older cg it indeed was like that In CB125F i noticed lesser vibrations in handle & feet rest as well. Lets see how it is in CG125S. No seat is still hard specially for the rider for pillion at very end seat is softer which makes sitting for pillion a bit more comfortable. GD110 has definitely alot more comfortable seat. Thanks Yes I Do Always Wear Helmet & Use Side Mirrors Always. Congratulations. How is this bike? Thanks, Kindly read the review. Its good from previous model good changes done. Flaws like too much vibrations, rear brake & chain cover noise issue sorted out. Introduction of self starter & 5 gears are very good changes. Main factors are the overall chassis structure which is adopted from Deluxe and 18 inches wheels. Does this one still have grinding noise when we release clutch??? No not a single time noticed as engine is same as installed in cb125f. And this irritating grinding noise was not present in Deluxe which now has been turned into cb125f. Yes deluxe don't have any grinding noise. This is risky thing to ride at high speed. I don't think, It is going to be stable at high speed same like the previous older model cg's. I will check top speed will update you bro i think it will sure do good & quit expected 110km/h. With light weight rider it may do 120km/h. My CG refuses to go above 105kmh. It once reached 110 but with head tucked down. Yes not all cg's go to speeds like 110+km/h but on average we have seen most cg's has ability to touch 110km/h & 115km/h as well. I have bought cg125 dream two times both touched 115km/h with normal riding position with my friend who is slim. With me both did 105km/h easily & in less opposing winds touched 110km/h as well but it happened some times. I am not racing kinda person I usually like to ride 70-80km/h and these are the best speeds to ride ohv cg engine. Just some times on highway have tried to drag my motorcycles just to check full potential power of motorcycle.